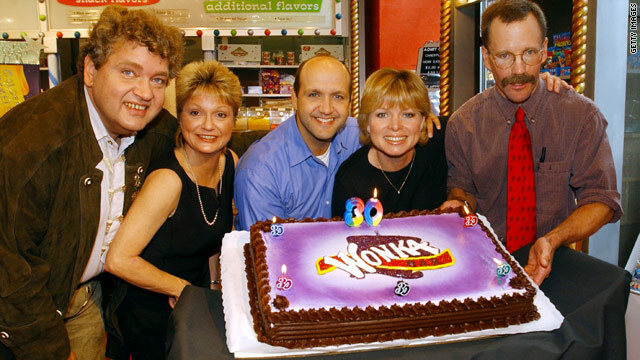 Thecast of "Willy Wonka" -- Michael Bollner, Denise Nickerson, Paris Themmen, Julie Dawn Cole and Peter Ostrum -- all grown up. (The Frisky) -- Oompah-Loompa, Doompity Doo. I've got an exciting update for you! If you weren't obsessed with "Willy Wonka and the Chocolate Factory" -- the 1971 version, not the Tim Burton remake -- when you were a kid, then you probably weren't born yet or maybe you lived in a remote cave. Weird kids, candy galore, a magical factory with little singing orange men? What's not to like? I drove my parents crazy, watching the VHS tape no less than four times a week, learning all of the songs. I still do a great rendition of Veruca Salt's "I Want the World" British accent and all. I begged my parents for lick-able wallpaper (anyone know what a "snosberry" is? ), and tried to chew as much gum as Violet Beauregarde -- I hid Hubba Bubba under my bed so I could pop a piece in before bed. I'm not ashamed to admit that I still watch the movie about once a year just to stay young at heart. I'm waiting for the film to lose its appeal, but so far, it hasn't. I mean ... there's a chocolate freaking river! That's why I was so psyched to see that Celebuzz tracked down the kids from the film. Aren't you just dying to know where their Golden Tickets led them? • We were thrilled when sweet and genuine little Charlie Bucket won a lifetime supply of chocolate in the film. Nowadays, Peter Ostrum fills up buckets of cow patties and other fun stuff as a large animal veterinarian in Glenfield, New York. Hey, he kind of resembles the Candy Man with that killer 'stache. • Violet Beauregarde was a precocious gum chewer who eventually turned into a blueberry. After getting one more gig on the soap opera "Dark Shadows," actress Denise Nickerson turned into an accountant at an engineering plant with a bad haircut. • Augustus Gloop drowned in a chocolate river. If I had to go, that's how I'd want it. Now Michael Bollner is drowning in a sea of success as a tax attorney in Munich. Go Gloop! • Veruca Salt was a spoiled brat who wanted it all ... NOW! It was even rumored that she wanted little Peter Ostrum behind the scenes. So what did Julie Dawn Cole end up with? A successful career in theater, television, and fitness. Oh ... and two kids. Not too shabby. • It was impossible to pull Mike Teevee away from the tube. Since then Paris Themmen has played a whole lotta roles. He was a commercial casting agent, a film production member, a Disney Imagineering employee, a retail salesman, a real estate agent, and a finance guy. He even started his own website, where he sells autographs. Maybe TV does rot your brain.